Allen Solly sent me on a fashion mission to spot five very chic women wearing Allen Solly. I must say, it has been exhilarating experience shooting for the blog post with five vivacious women. CHINMAYI P: Chinmayi is a researcher in Molecular Biology by profession. Adventure junkie, her "must-do" adventure activities include trekking, biking, sky diving and globe trotting. I love how Chinmayi has styled the simple Allen Solly orange structured dress with bold accessories of color red. The hint of gold in the form of bag completes the look perfectly. KRUTHI KOTA: Kruthi Kota is a final year MBA Student from Jain College. I am a huge fan of mix matching and print clashing. I love how Kruthi has styled the bird print Allen Solly dress especially the hint of leopard print via her footwear. The puff hairstyle, beige trench coat, orange lips and belt complete the look perfectly. DIVYA SHET: Divya Shet is a junior research fellow at Indian Institute of Science. 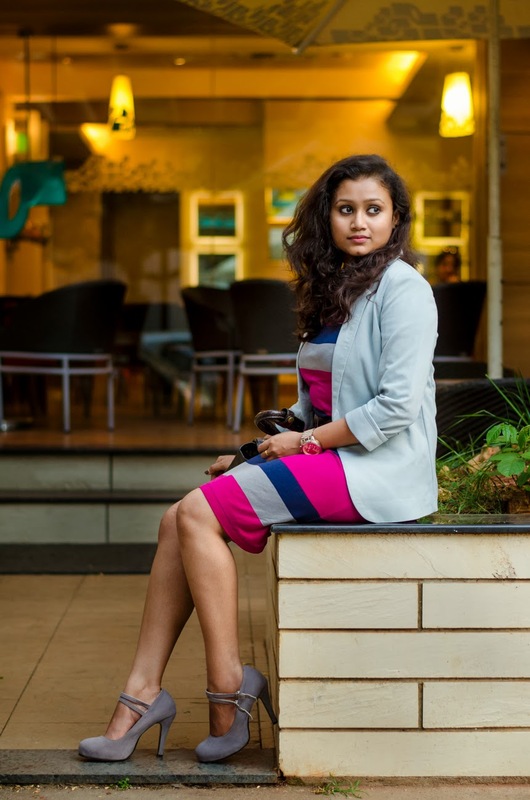 A Coorgi at heart, she shifted to Bangalore two years ago after her marriage. I could not take our eyes off Divya walking out of her office looking effortless chic in her Allen Solly polka dot dress. I love how she has added matching accessories to complete the look. PRAJWALA JAYRAM: Prajwala is an intern at Castrol India Ltd. I found this leggy lass, outside her house on her way to a party. Black and gold is my the eternal favorite combination. The bold anklet adds oomph to the black sequin Allen Solly dress. DEEPIKA: Deepika is a Final year MBA student from Acharya Institute of technology. I have a soft corner for stripes. I was amazed how Deepika had styled the Allen Solly stripe dress for a coffee meeting. The grey blazer to compliment the pink and blue stripes. The grey Mary Jane pumps completed the perfectly.